Suprose: The Roundtable - Writers Block: Is It All In Your Head? The Roundtable - Writers Block: Is It All In Your Head? In this month's featured author Tête-à-Tête, Thrity Umrigar, (http://suprose.blogspot.com/2012/03/tete-tete-with-thrity-umrigar.html) smiles and says - "I refuse to believe in writers block. I refuse to talk about writers block"
Suprose talked with three prolific authors about their thoughts on Writers Blocks. Do they/Should they exist? How should writers address it, to best overcome and surge ahead with their writing? 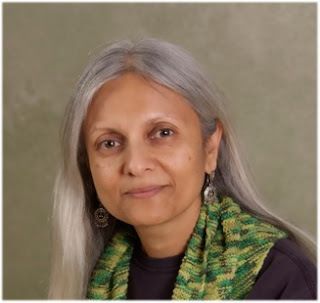 Uma Krishnaswami is the author of over a dozen books for young readers, from picture books through novels. "I am a writer. This is my job. I don't have the luxury of writer's block. I can't afford to entertain feelings of being unable to write. If I did, it would all be over. But what I can and do understand and experience, is something I call "writer's emptiness." Sometimes I feel as if I have simply used up all my words. I have no more left. The good thing is that when this happens, I have learned to recognize the feeling. If my word bag is empty, I need to go fill it up all over again. The way to do this is also simple. When I feel as if writing has drained me of language, I replenish it by reading. I read for a few days straight, and I try to pick up a wide variety of texts. Sometimes I deliberately read work that is really different from the current work in progress. A few days of this, and when I return to writing, I always find that the energy gradually returns; the spring begins to bubble again. I should add that not only do I feel this emptying at least once with every major project I've ever undertaken, but that if it didn't, I'd worry. It's part of the process. If a story doesn't challenge me by using up everything I can throw into it, then it means I haven't worked hard enough, or gone deep enough. I suppose what I'm saying is that you have to find the metaphor that moves story along for you, whatever that metaphor is. You can't be self-indulgent, but you must be self-aware. Of course it's all in your head, but so is fiction. In the end, our thoughts and intuitions are the only instruments we have. We have to work with them, not against them." Uma Krishnaswami was born in India and now lives and writes in northwest New Mexico. Kirkus Reviews called her latest novel, The Grand Plan to Fix Everything "...as wonderfully convoluted and satisfyingly resolved as any movie plot could be." Uma is widely recognized for being a major voice in the sharing of international and multicultural viewpoints in children's literature. She is also on the faculty of the Vermont College of Fine Arts MFA program in Writing for Children and Young Adults. 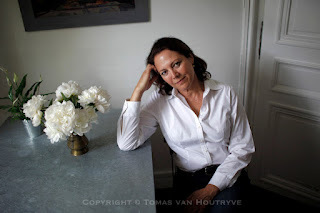 Author Mira Kamdar's essays and opinions appear frequently in The Caravan magazine, the New York Times' blog India Ink, and the Courrier International. "My fail-safe cure for writer’s block is a deadline. In fact, I am writing this now only because I’ve been given a deadline of tomorrow. With a few exceptions, such as when editors ask me to turn around a short piece within days, or even hours, the deadline begins its life as a remote thing. I put it on my electronic calendar and forget about it: closer deadlines occupy my immediate attention. At some point, the deadline begins to haunt me. As time hurtles me toward it, I start thinking more and more about what I have to write. Since I write nonfiction, there is generally a certain amount of research I need to do before I am ready to write. I find myself, between other tasks, starting to notice anecdotes, news stories, conversation snippets that relate to my writing assignment. If I need to do substantive research or interviews, I schedule first visits to archives or libraries and send the first emails or make the first phone calls to people I want to interview. I collect my notes and any other material in a folder. As I review and add to these, I experience a series of “ah-ha” moments where obvious points reveal themselves. These points start to connect with each other. This process is largely driven by my subconscious which always is working much more consistently on the writing assignment than I am consciously working on it. As the deadline approaches, connections start multiplying furiously. At some point, a working title emerges that seems right. Meanwhile, I often find myself finishing up all kinds of tasks that have nothing to do with the deadline but that I can get done easily and which give me the comfort of having completed useful things. These tasks can be as basic as cooking dinner or doing laundry or paying bills or readying tax returns. This temporarily soothes my growing discomfort with the unfulfilled deadline. As the deadline approaches, however, it begins to scream silently at all hours of the day and night no matter what else I am doing. At some point, as close to the deadline as I dare, it all becomes unbearable and I sit down to write. I usually have a few rapid false starts with the opening sentence. Finally, I get one typed that satisfies me and that opens up a path to what must follow it. As I write, as I begin to give narrative form to what is still usually at most a list of essential points I want to make, the writing starts to take over. The real pleasure comes in those moments where the words seem to write themselves, surprising me by their flow and the way they articulate exactly what I didn’t know I wanted to say. The real pain is coming up against moments where I am at a loss for words, where I think I know what I want to say but can’t get it to come out right on the page. Sometimes, I have to just get up and go do something else and come back to it. Then comes the rewriting. For me, rewriting can throw up a bigger block than writing. Often, I have to sacrifice the very passages I thought were the best when I wrote them. I usually have word limits, and I always have to cut a lot and think of more economical ways to say what I want to say. This can feel like infanticide. My biggest writer’s block is one I have lived with for decades now. It’s hampered me for so long, I’m sure, because there is no external deadline, and I haven’t been able to impose one on myself. This is the block I have about writing fiction. I really want to write fiction. Several of my editors have told me, based on my nonfiction writing, that I should write fiction. Over the years, I have had many ideas for stories and I still harbor a couple of ideas for novels. Yet, I can’t get started. I am seized by panic and fear when I even think about starting. I cope by taking refuge in multiplying nonfiction deadlines. That way, I feel like I am accomplishing something while the thing I most want to accomplish remains undone. Nonfiction writing is the way I cope with my fiction-writing block. The more awful I feel about not writing fiction, the more furiously I write nonfiction. This strategy has worked for decades to defer the terrifying moment of sitting down to write what I really want to write, but I’m not sure it will work forever. What will happen if I ever break through that block, I cannot tell." 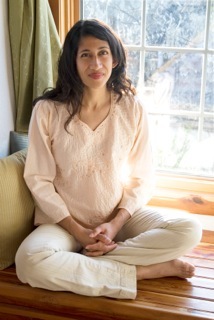 Mira Kamdar: Born to a Gujarati father raised in Burma and India and a Danish-American mother raised on a farm in Oregon, Mira Kamdar has navigated between different localities and identities her whole life. As a four-year-old, she asked her mother: “Which way am I half? Up and down? Or sideways?” She is still trying to find the answer to this question. Her books, Motiba’s Tattoos: A Granddaughter’s Journey from America into her Indian Family’s Past (Public Affairs 2000; Plume 2001) and Planet India: The Turbulent Rise of the World’s Largest Democracy and the Future of our World (Scribner 2008), hav been translated and published in over a dozen foreign editions, including Hindi, Chinese, Arabic, Dutch, Italian, Portuguese, Spanish and French. She lives in Paris, France. Padma Viswanathan, writes fiction and is the award winning author of "The Toss Of A Lemon"
"I said to myself this morning, as I circled, for a second day, around a difficult topic, “It’s not going to be good.” I meant my writing: there was no way that my first try at writing this very difficult new material into my existing novel draft was going to result in anything truly readable. Whatever I put down, I had to be prepared to wince when I first re-read it. At worst, it would be no more than a place marker. At best, it might contain a few phrases tonally accurate enough to keep through what I knew would be multiple, decimating revisions. “Writer’s Block,” as far as I can tell, often comes from an artificial perfectionism, from the need to have something right the first time. I think this is almost always true for inexperienced writers. I admit that, in the case of experienced writers, it can signal something deeper. There could be psychological problems at work: they are endemic among writers, and not to be ignored, but there again: it’s still not “writer’s block,” exactly. It’s a sign pointing elsewhere. Sometimes I need to wait it out, take a nap, make a cup of tea. Do some weeding; read about people with worse problems than your own. It’s just writing. It can wait. It can wait years if you need it to, but usually you won’t. Sometimes there is a real-life problem, something urgent and troubling that I need to deal with before I can return to imaginative work. But when it’s a case of fearful self-criticism, as it so often is, I make myself remember that even if it’s bad, it’s good enough. All I needed was to force myself to splash on the first layer of paint. Then I’d be able start scraping, and blending, layering and texturing. But unless you pinch your nose and start—Write it! Write the stinker!—none of that can happen. Thrity’s right: Denying the existence of Writer’s Block is a healthy, even a robust, epistemological stance. Writing works best when it is an act of discovery, while Writer’s Block implies some foregone conclusion about what must be written—a deadening impulse, one that denies the surprise knowledge that sometimes can only emerge in the act of writing itself. And look: after reassuring myself that it was going to be awful, so that I could go ahead and write without expectations, I got the passage out and, when I read it over, I heard myself saying, it’s good. It’s good." "On days when I am troubled, when I am grieved, when I am at a loss for words, the mechanics of formulating sentences, and of stockpiling them in a vault, is the only thing that centers me again." says Jhumpa Lahiri in a New York Times essay titled My Lifes Sentences. Sounds like this may be a tool that she uses when she is at a loss for words.